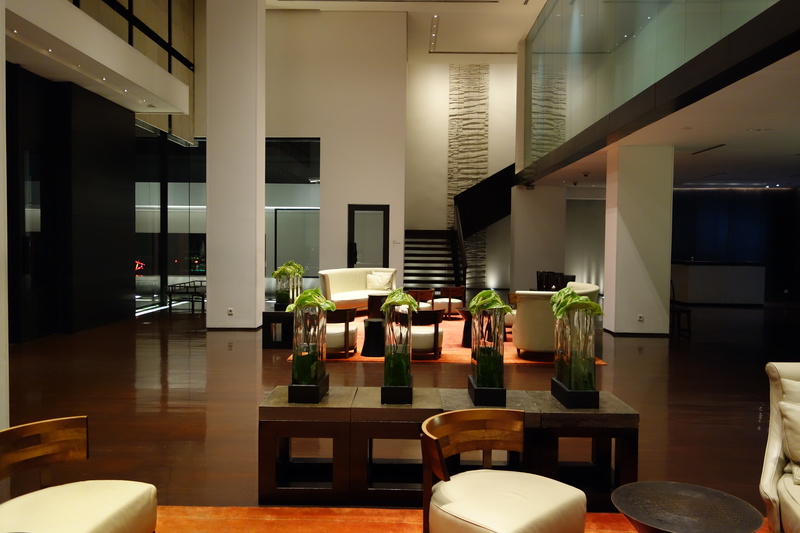 Phone: +66 2 625 3388. 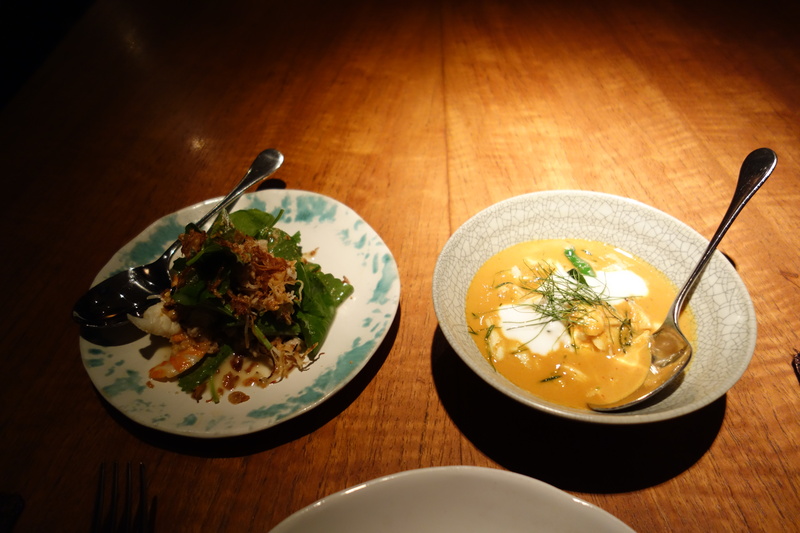 Three things really impressed me about my first dinner at Nahm. 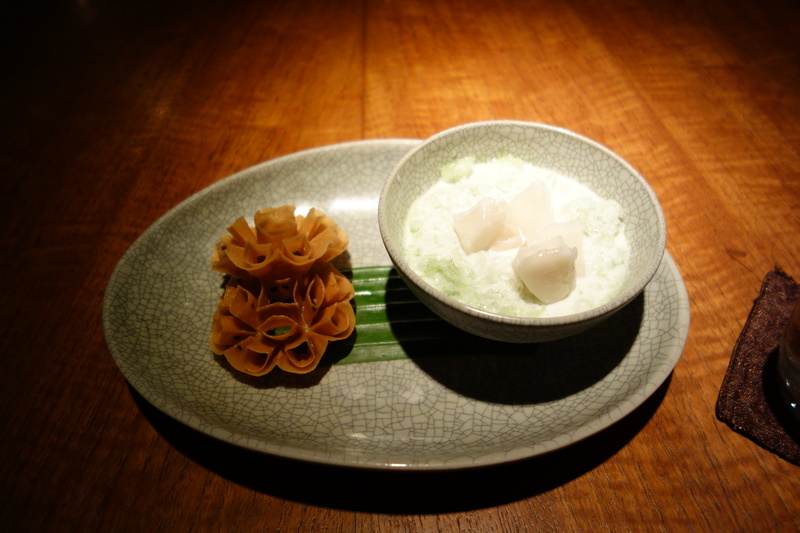 The first was a dessert that was a symphony of heaven, combining icy coconut milk with hot crispy sesame biscuits broken within for an imitatio of the most delicious bowl of cornflakes, with the intermediate soft texture of sweet-sour custard apple. 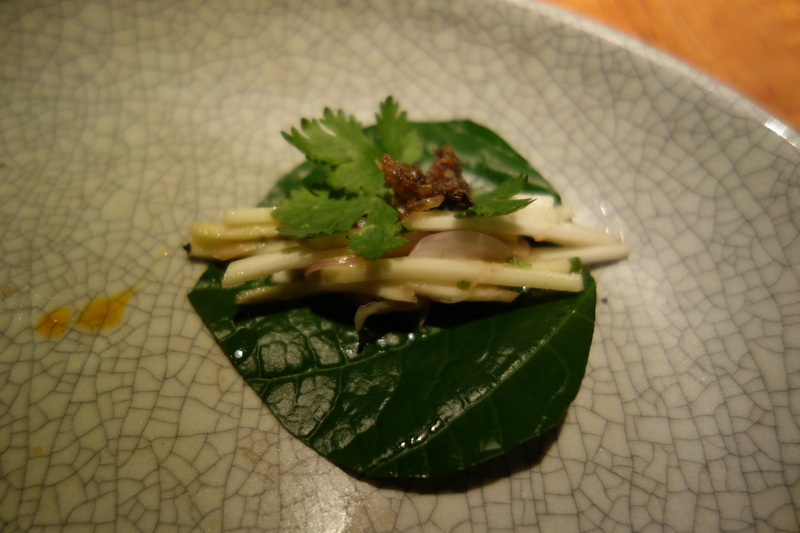 The second was a relish dish that featured two top-class and novel (to me) ingredients, white turmeric and “sour leaves”. 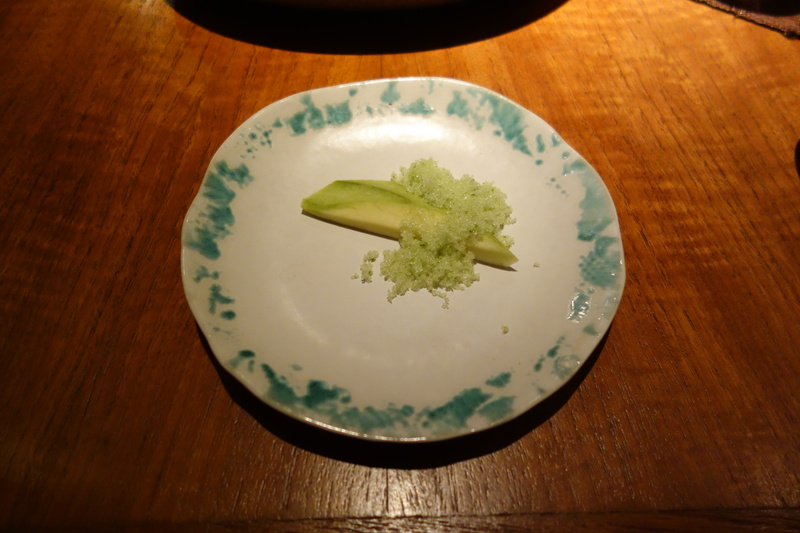 The third was a general feeling of precision that pervaded all dishes. 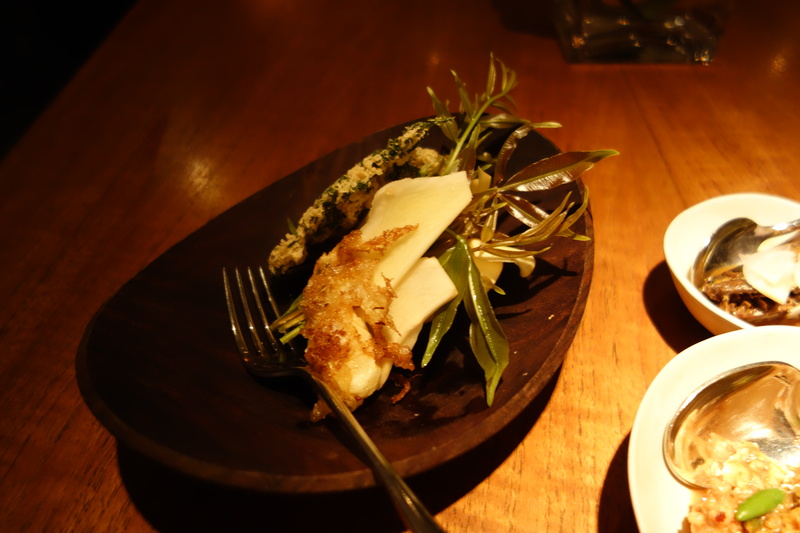 No matter whether I loved the dish, or merely liked it, I felt that the cooking was precisely calculated to produce the effect it ended up having. 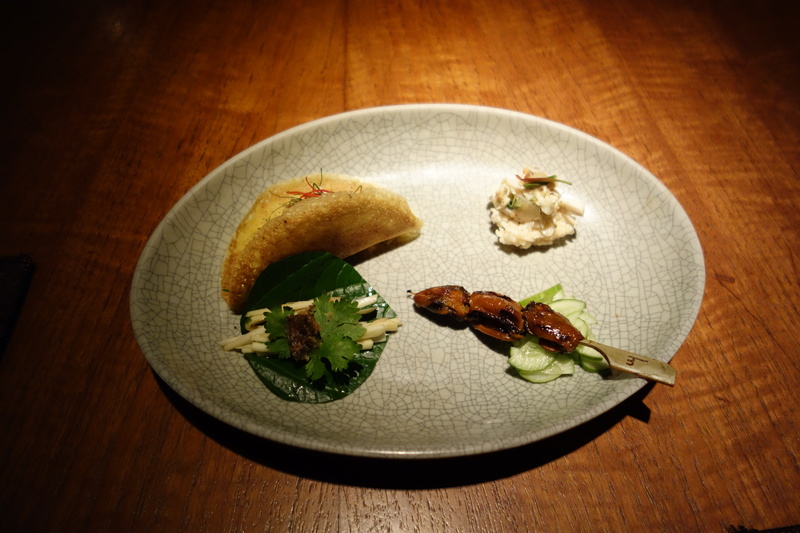 The little touches – the surprisingly satisfying crunch of the apple eggplant, the betel leaf taco in the canapes – all felt thoroughly thought through. 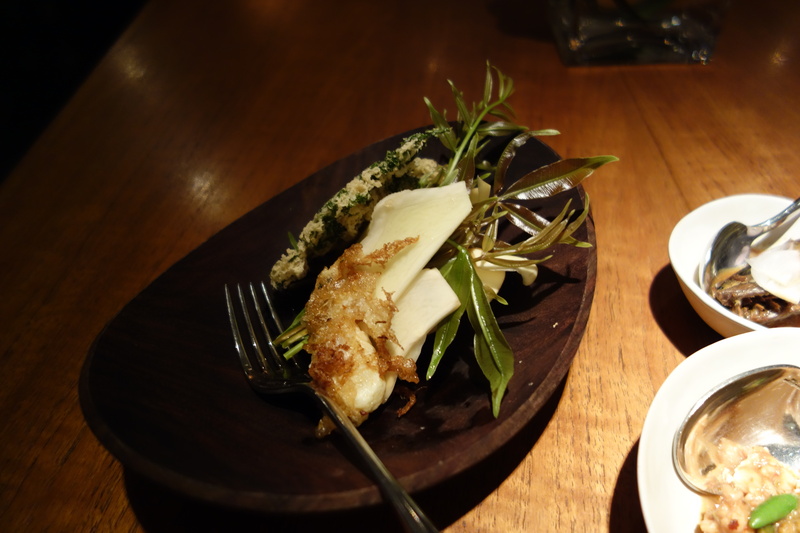 I’ve met a few food enthusiasts since I’ve returned to Singapore. Their reactions to Nahm have on the whole, been polarized. 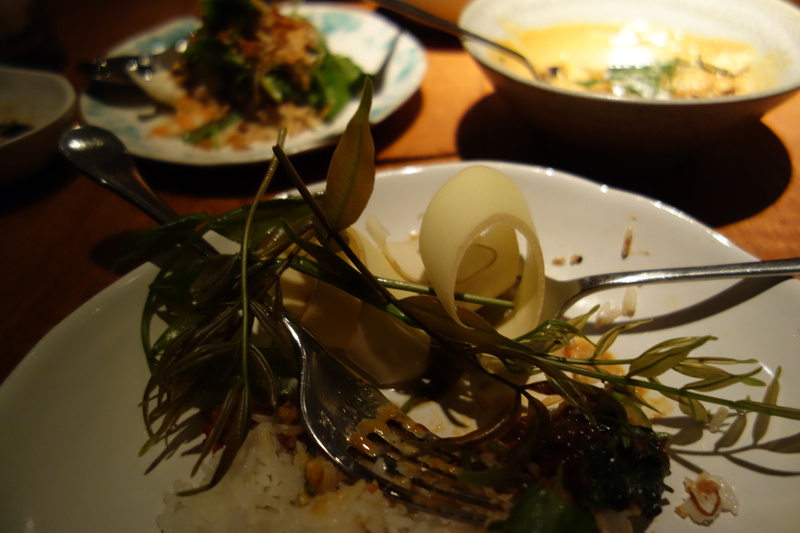 I don’t believe that at such a precise restaurant, the fault is some variance on the end of Nahm. 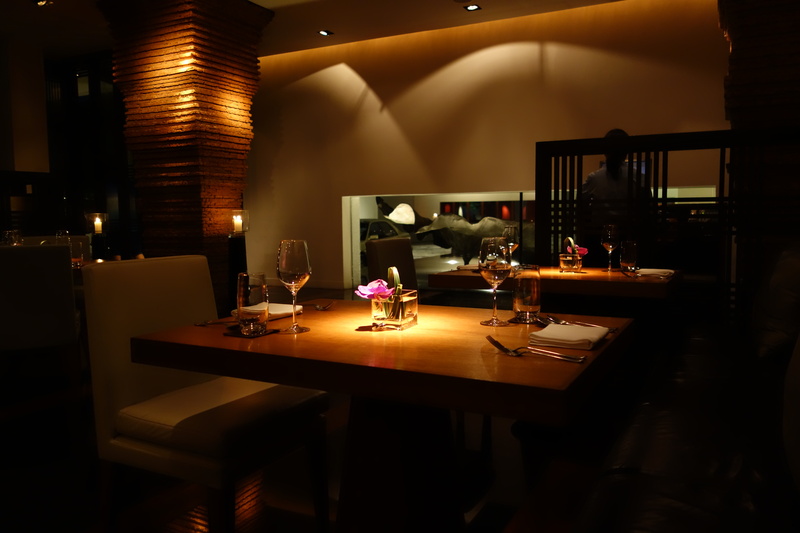 Rather, the root cause is the inflated expectation created by the breathless acclaim it has been receiving recently (culminating in being named Asia’s Best Restaurant for 2014). Any list that claims to pick a #1 restaurant is silly, there are good restaurants, better restaurants, and the best restaurants, but there will never be a #1 restaurant. 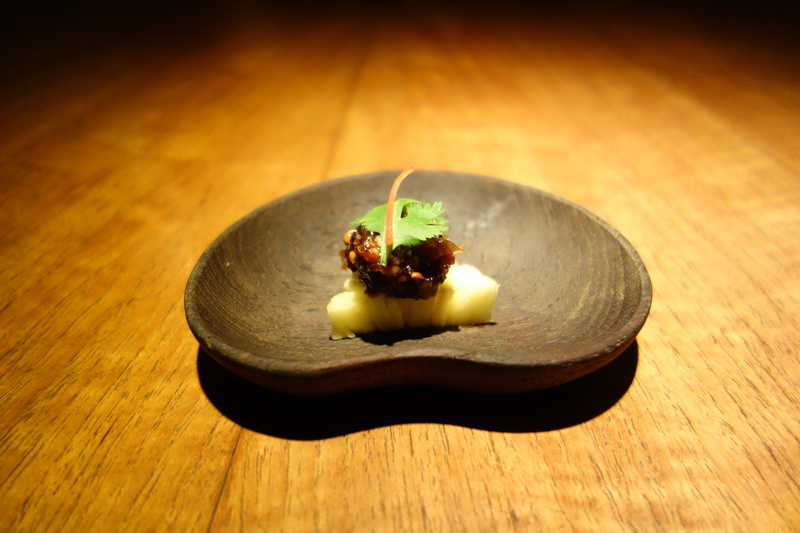 Rene Redzepi, writing in his recent one-year journal “A Work in Progress”, mentions how much pressure being named #1 restaurant in the World piled on him, and how he was unable to enjoy his work in the first half of 2011. 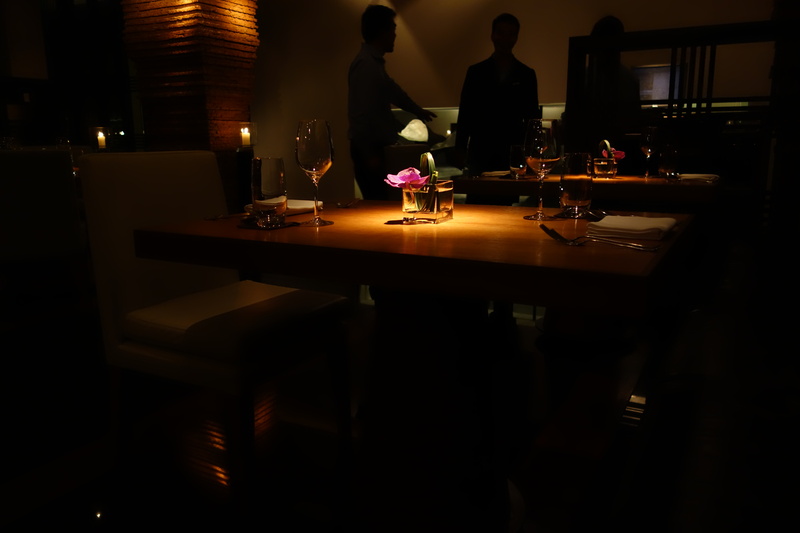 (If there’s one big thing Michelin does right, it’s keeping a non-ranked 1st tier of restaurants – the three stars). 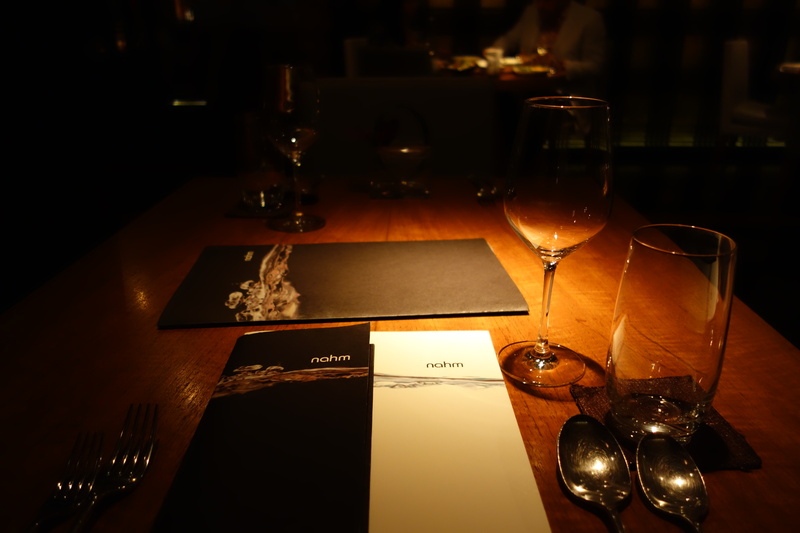 I can’t tell how much pressure being named #1 restaurant in Asia brings to the Nahm kitchen and Chef David Thompson, but it changes the diner’s mindset to “once-in-a-lifetime-ism”, setting up expectations of ortolans flying out of cakes and stepping in expecting the last supper. And Nahm is poorly suited to play the role of “once-in-a-lifetime” experience, because it does not convey to the average international diner (and that includes me) drama and narrative. Firstly, the dishes come out all at the same time, family-style. 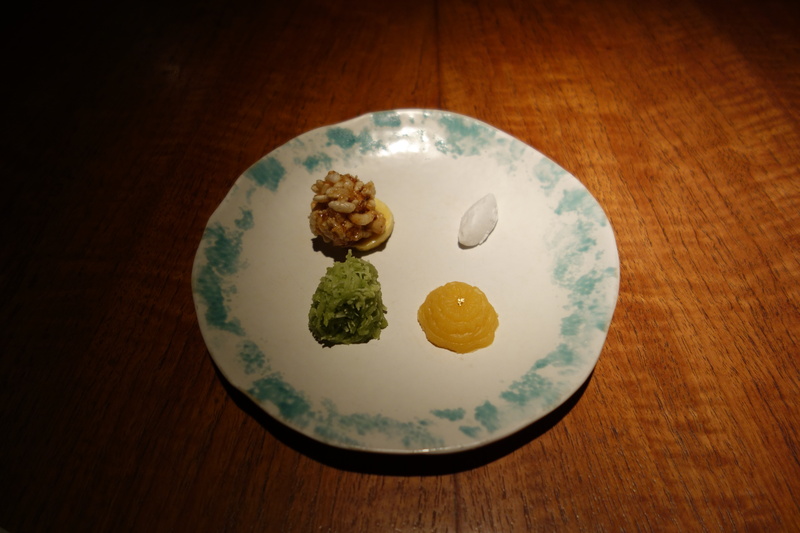 The tyranny of the tasting menu is well-remarked, but temporal sequencing of dishes allows narrative in a way that family-style serving does not. 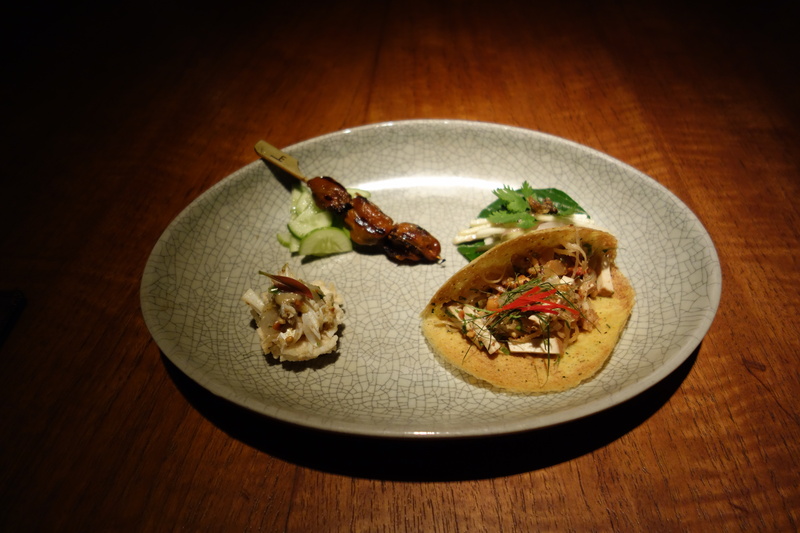 Secondly, Nahm’s drama and narrative (as far as I can tell) draws upon its revival of centuries-old traditional Thai recipes, written in ancient Thai cookbooks, and therefore set in a culture and language that most international travellers cannot parse. This means that these international diners evaluate the food on a purely solipsistic* basis. 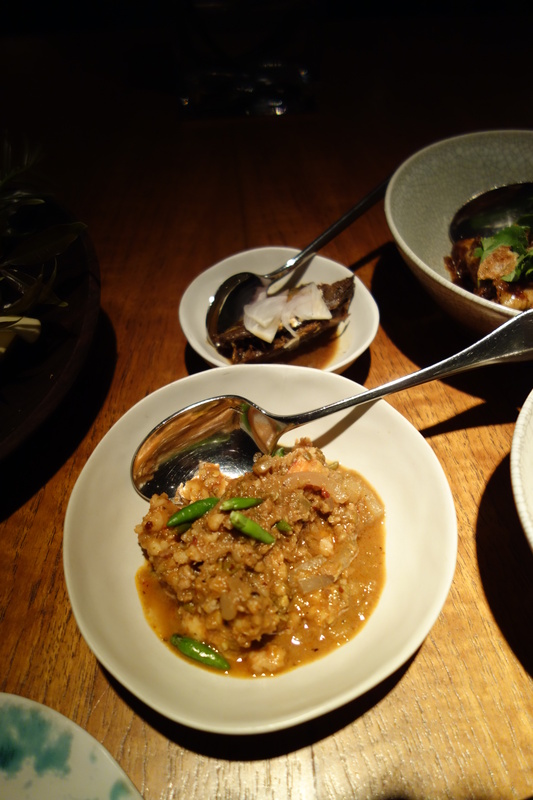 And Nahm does Thai food superbly well. 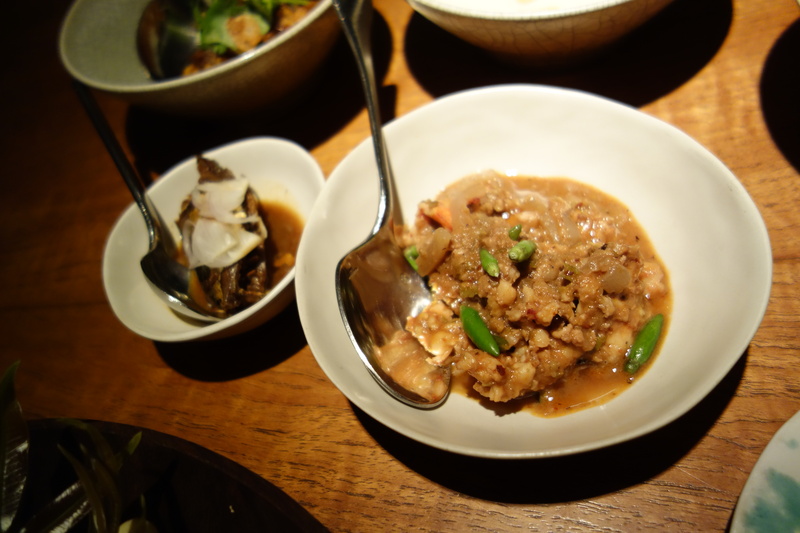 But between aversions to spiciness (barbarism or misfortune) and unfamiliarity, a solipsistic basis in evaluating dishes served family-style results in a disjointed experience of “I like this, not so much that”, which prevents the narrative build-up (crystallization a la Stendhal) that is almost surely necessary for “once-in-a-lifetime experiences”. There are weaknesses. 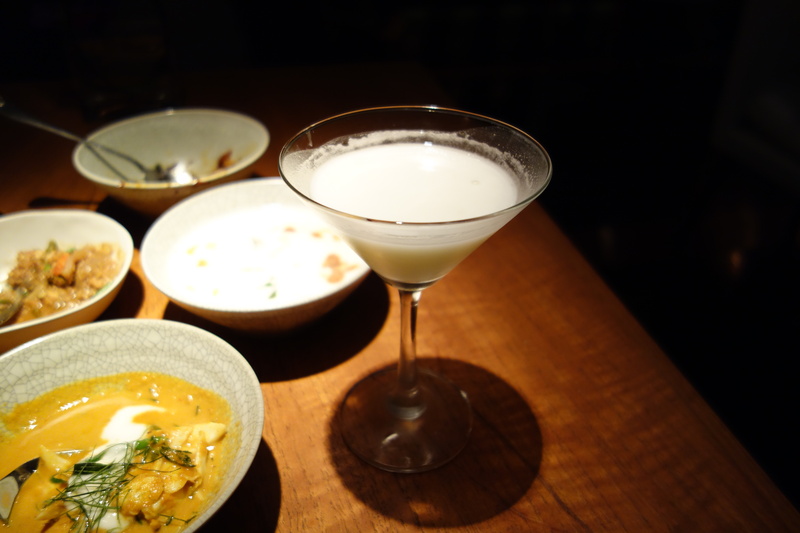 The cocktail program could be improved, for instance, to shy away from tacky combinations like the Coconut Soup Martini, which wasn’t very good. 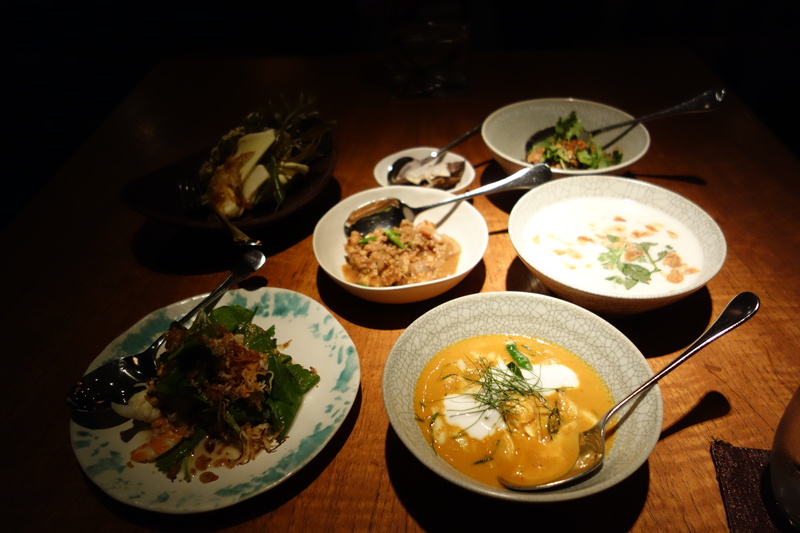 But the unique feature of Nahm is its promise to revive traditional Thai dishes and serve them to the discriminating public – and such a strength, abetted by David Thompson’s precise cooking and laudable ingredients sourcing, justify Nahm’s acclaim. **Rather amusingly, the next table, a couple, ended up asking for Pad Thai when confronted with the menu. 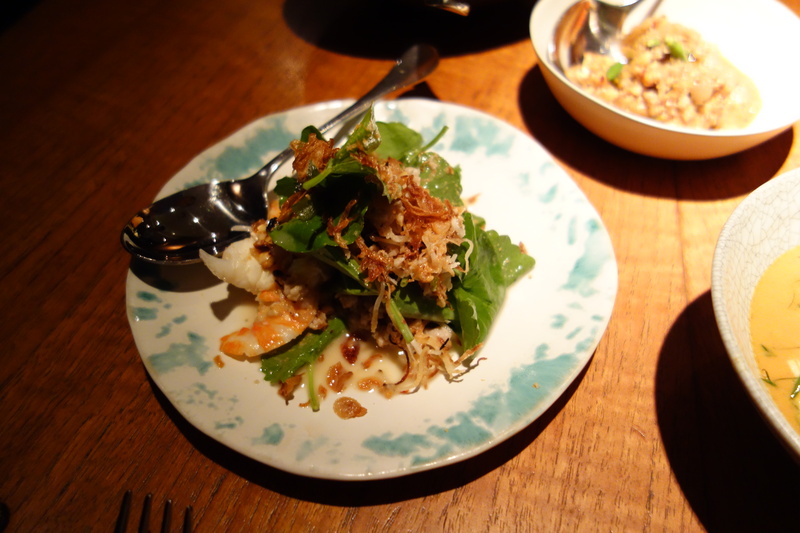 Given the possibly foreign and recent origin of Pad Thai, it would have been out of place at Nahm. 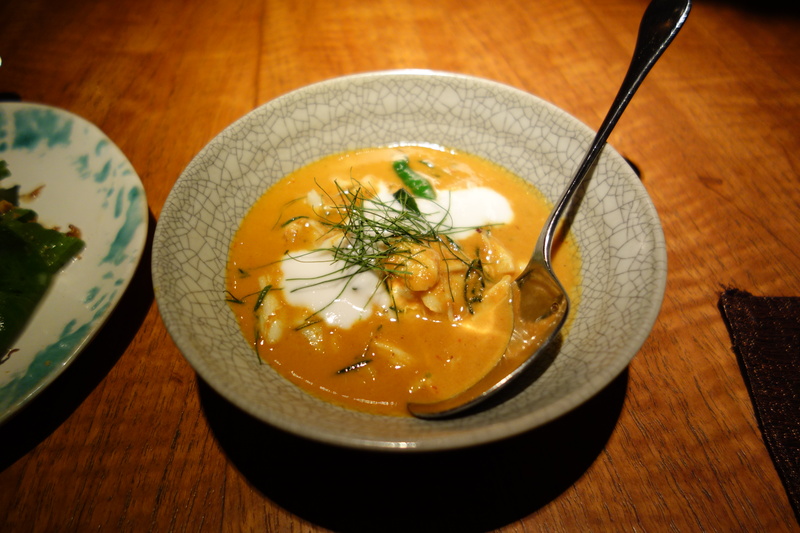 But how in the world do you get a reservation at Nahm while remaining ignorant of the kind of Thai food they serve? a terrific, bitter-ish taste from betel, taco-like around the sour green mango and salty bit of fish. 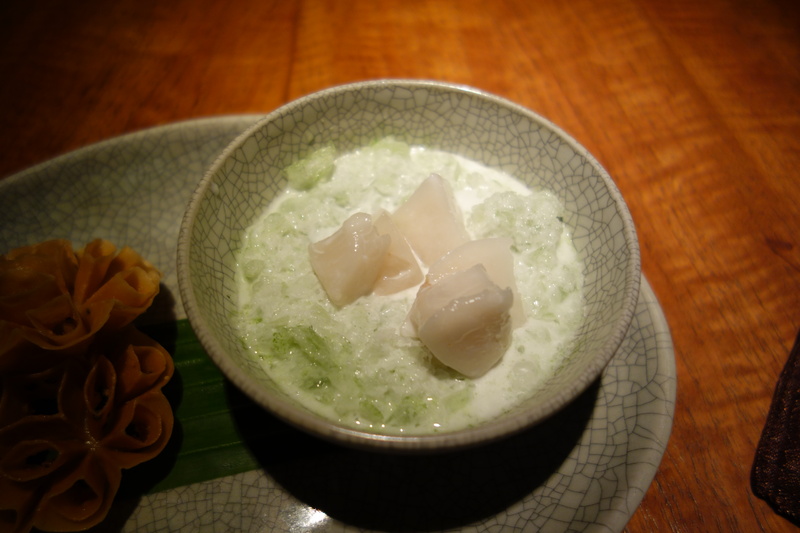 Unusual, an opaque soup that had green mango to add a sour tinge. The “sour leaf” (that’s how it was described) was great, possessing a mild and pleasant sourness that is milder than any lemon or lime I have tried. 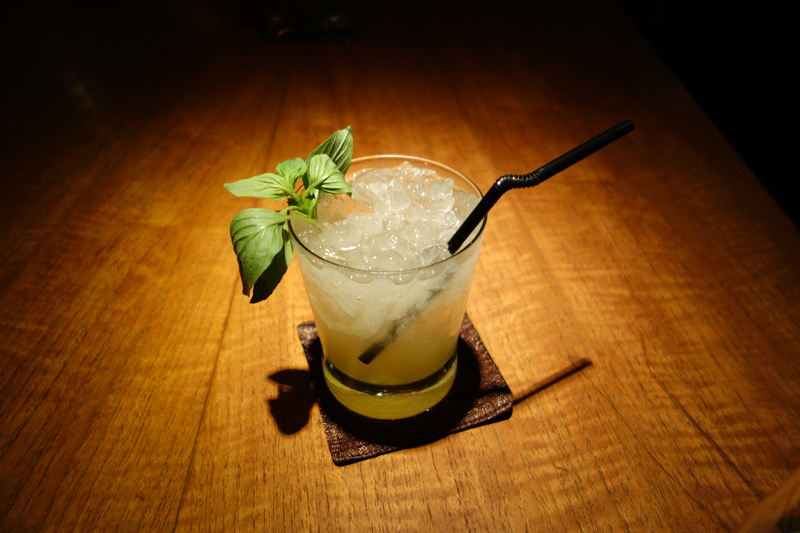 Cooks who enjoy using subtle effects, would benefit from a fresh supply of these sour leaves. 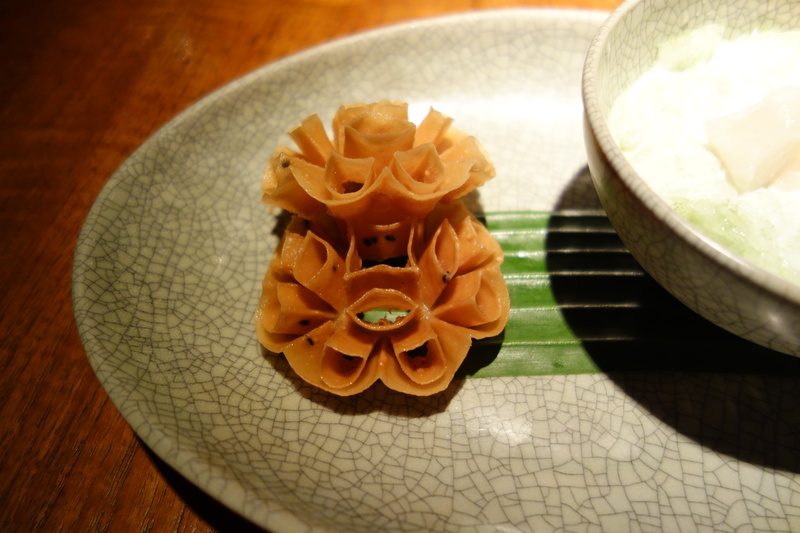 Served with banana flower. 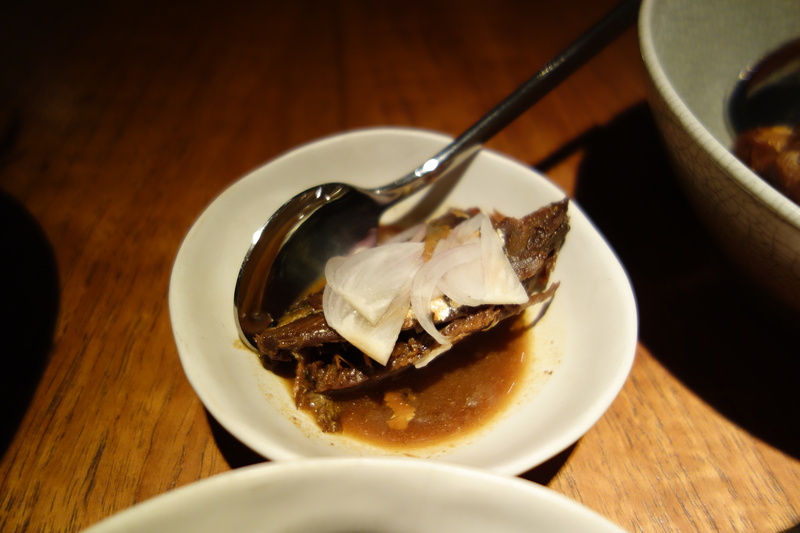 The apple eggplant had an enchanting texture, like soft jelly with a satisfying crunch. A brilliant ingredient. slightly too unguent for my taste. A dish to die for. These fresh sesame biscuits were still coated with just the thinnest film of oil when they were served fresh next to a cold bowl of iced coconut cream. When you break up the warm sesame-encrusted biscuits over the iced coconut cream, it feels like eating the world’s best* bowl of breakfast cereal. 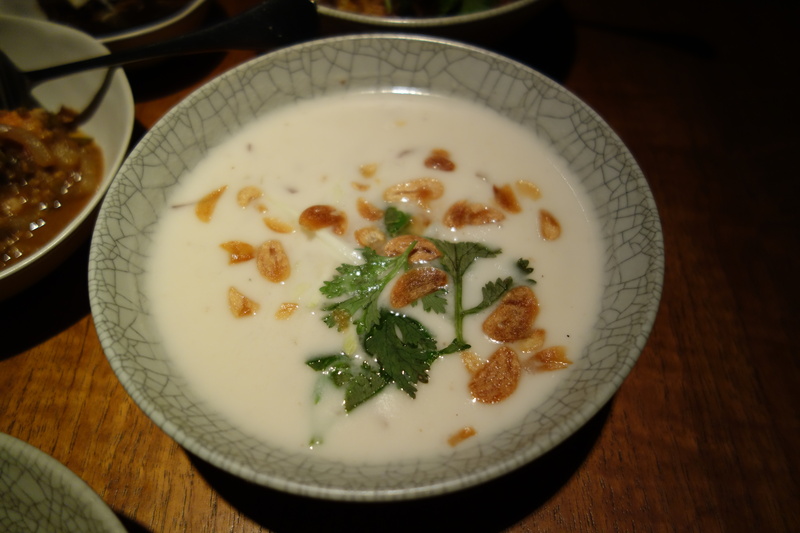 Instead of cold milk, we get the rich taste of cold coconut milk, and biting into the sweet warm biscuits like crunching into fresh warm sugared cornflakes. A magical contrast of hot-and-cold, crunchy-and-soupy. Custard apples provide a sour-sweet soursop taste, with firmer texture, a beautiful dish. Truly spectacular.